Wednesday saw me booked into the temporary reading room at London’s Imperial War Museum. The main museum is undergoing a £35m (€41.5m) refit, and will open again this summer, with its main gallery dedicated to the Great War (as a largely irrelevant aside, for a snapshot of Britain in the run-up to WWI read George Dangerfield’s seminal The Strange Death of Liberal England). Meanwhile researchers have to squirrel themselves away in a redbrick Victorian pile a stone’s throw from Elephant & Castle, possibly the most depressing spot in London. My visit, the first of four or five days in IWM London, was for the private papers of Neil ‘Billy’ McLean, one of the key British Liaison Officers to serve in Albania. McLean is not to be confused with the much more famous Fitzroy Maclean, Churchill’s personal envoy to Tito in Yugoslavia, author of Eastern Approaches and supposed model for James Bond. 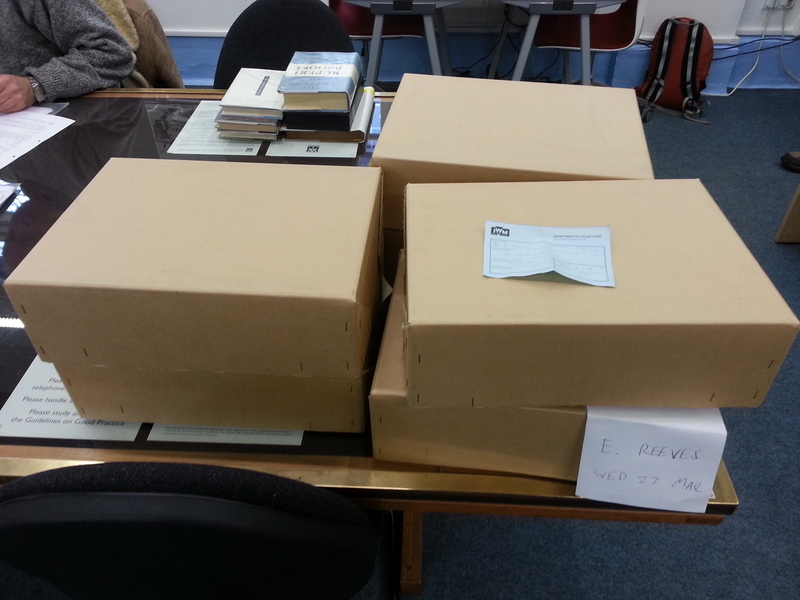 McLean’s private papers, I had been forewarned, were a) copious and b) uncatalogued. Waiting for me were six large cardboard boxes, pictured above. * There’s a job of work here, I thought. I found that the actual parachute jump was one of the most pleasant I had ever made. Far more pleasant than the five practise [sic] jumps I had made in the S.A.S. Training Camp at Kabrit. It was also far less difficult than I had imagined it would be. Sometimes in Cairo after a particularly debauched night, I would lie in the afternoon on my bed in Shephard’s [sic] Hotel and imagine the scene of the operational jump. The green light and everyone looking ghostly and strained, and outside cold and very black. The slip-stream rushing by and the hollow feeling in the stomach and invisible hands, some pulling one out, others pulling one back. The absolute certainty that the slipstream would knock one against the side of the aeroplane, so that the parachute would not open properly, or perhaps only half open, or perhaps not open at all. The unknown land below so cold and dark and menacing. One literally sweated. But, in fact, the operational jump was a piece of cake. Like nearly all things that one is worried or anxious about, the thing itself is so much less bad than one’s idea of it. This, of course, is also true of good things one hopes to happen. They also fall almost always far short of one’s expectations or desires. Possibly only boredom and hate, illness and bad temper, quarrels and unsuccessful relationships with people are worse than one imagines. McLean starts as he means to go on – often his diary, written up from notes when he was an MP after the war, reads more like the skeleton of a novel. Perhaps he was planning to fictionalise his experiences, as did Anthony Quayle (Eight Hours From England) and Jerry Field (Three Seconds to Die – I appear to have bought the last available copy and it’s arriving any day now; hopefully it’s totally bonkers like its author). McLean was a highly literate man, after all. In his pack on that first jump were the complete works of Shakespeare, Keats and Shelley, Voltaire’s Dictionnaire Philosophique and all the Russian classics. Guns and grenades would have been far too common. The stage communist. Unshaven, dirty clothes, long finger nails. Produces paper, rough manners. Contempt. Tries to be much older. Affected way of narrowing eyes in order to look sinister. Way of accepting tea. I despise these comforts but it doesn’t make much difference. These unimportant things. Young, speaks French, reasonably educated. He never washes and he has a brown speckly colour. He acts as a stage communist, always sinister and secretive. He has an affected trick of narrowing his eyes, as if about to pass the death sentence on some enemy of the people. He often took out of his pocket letters which were probably directives from the communist party. After studying them studiously he heavily marked them with the blunt stub of his pencil. Aleco always accepted a cup of tea very ungraciously as if he disapproved strongly of anyone being able to offer to anyone a cup of tea, or anything else. But, as such habits existed in the evil capitalist world he thought it was probably simpler to accept the cup of tea as, anyway, very little time remained for these bourgeois capitalist customs to continue. Aleco also was very suspicious of all of us and had very bad manners. So he was not the best of company. 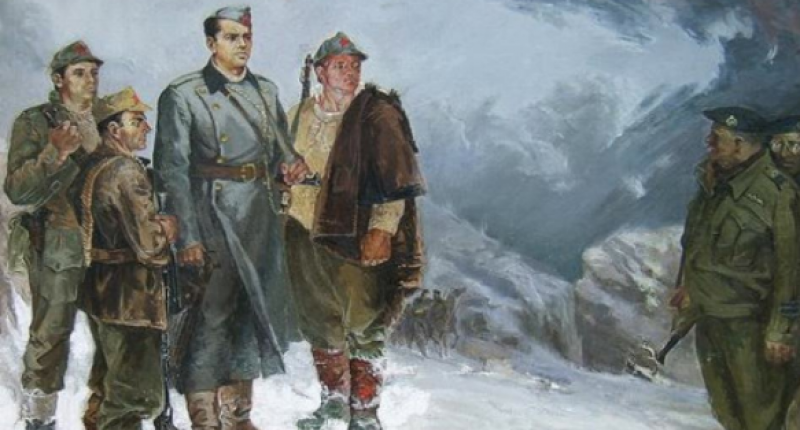 Sometimes he would stare at the perfectly ordinary map of Argyrocastre [Gjirokastër] area for about 1/2 hour on end or even an hour mouthing out the names of the villages under his breath. Last Christmas lunch I sat next to a retired brigadier who had known Smiley. I got the impression that he wasn’t a man you’d go to if you needed a shoulder to cry on, but still. His reading matter for that first mission, it’s worth mentioning, was the latest copy of Horse & Hound. A slow, pleasant, but somewhat stupid country Englishman with a streak of animal cunning. Partisans tell of British officers sending peasant boys fifteen miles through enemy-patrolled country for a bottle of raki. I believe this is true. Bal Kom [Albanian nationalists opposed to the partisans] shepherds have been shot at by British officers simply for approaching a camp in the hope of scrounging a mug of coffee. Liaison has been a one-sided affair, the sort of liaison between a grubby fourth form schoolboy and an unapproachable form master armed with a large cane. A reminder that not all BLOs had McLean’s sensitivity or subtlety. I have five more boxes of his private papers to work through. Interesting times. *Photography is strictly prohibited in the reading rooms, but the staff were kind enough to make an exception after I pointed out that a photograph of six cardboard boxes wouldn’t bring the Imperial War Museum tumbling down. Bill Eden the cockney saboteur the museum only sent me part of the oak tree journal that your father wrote please reply.